Heavy solid brass 3" wire buckle used on 30/40 Krag belts. 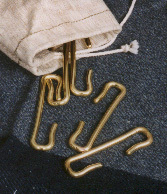 Heavy solid brass 3.5" wire buckle used on 6 mm Lee belts. Heavy solid brass 2.25" wire buckle used on pistol belts.